Home » Product News »	Is it time to take a closer look at 360° cameras? In a challenging economic climate and with end-users understandably demanding maximum ROI from their investment in video surveillance systems, it might be time for installers to take a closer look at how 360° cameras could give them a competitive edge. 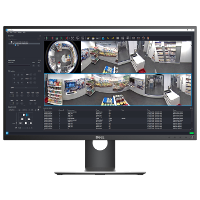 Simply put, 360° fisheye lens cameras are able to reduce the cost of video surveillance in many situations as they can be used to monitor very wide or large areas. Cost savings are achieved by significantly reducing the number of cameras needed for video surveillance projects in environments such as airports, hospitals, large office reception areas, retail and public spaces. In addition to a reduction in capital costs, they are straightforward to install and commission. With no moving parts, 360° cameras also offer further cost savings in terms of maintenance.